Why did Ron Tammen get his blood typed? - A Good Man Is Hard to Find - My Search for Ronald H. Tammen, Jr.
Why did Ron Tammen get his blood typed? Something I’ve discovered as I’ve been researching the Ronald Tammen disappearance is that there’s never a straightforward route to a solution. Scads of rabbit holes are lying in wait between point A and point Z, and the minute you start tunneling down one of them, there will invariably be an unrelated side burrow needing to be checked out. It’s kind of like driving from Cleveland to Cincinnati and getting caught up in every roundabout and cul-de-sac along the way. It’s a road trip, and road trips are generally awesome, but who really knows when we’ll be hitting I-275, let alone the Skyline Chili at 7th and Vine? Case in point: For the past two weeks, I’d been placing calls and sending out emails to the former residents of Fisher Hall following up on our “woman from Hamilton” lead. The conversations have been captivating, and I’m amazed by the large number of octogenarians who are able to retrieve obscure college memories on demand. (Seriously, can you recall the name of your resident assistant from your freshman year of college or reel off the number of your dorm room or your class schedule? Some of these guys honestly can.) And then, during one such conversation, another side burrow came into view: a possible clue related to Ron’s blood type test. Remember that story? On Wednesday, November 19, 1952—five months before he disappeared—Ronald Tammen had stepped into the office of Dr. Garret J. Boone, a family physician in Hamilton, Ohio, who also happened to be the county coroner. The reason for Ron’s visit was to have his blood typed, which seemed odd to Doc Boone. It was so odd, in fact, that, when he later realized that the young man was the same person who disappeared from Miami, he dug up Ron’s medical record and contacted university officials to see if the new information might help in their investigation. But the officials weren’t interested in what Doc Boone had to say. He was angry by the “brush-off” (his word choice) he’d received, and kept that potential lead to himself until 20 years later, in 1973, when he told Hamilton Journal-News reporter Joe Cella. So what about a paternity test? A couple years ago, I spoke with a person at the DNA Diagnostics Center, a national paternity testing laboratory and affiliate of the American Pregnancy Association. Paternity tests in the 1950s were generally conducted six months after a baby was born, for the baby’s protection. Six months prior to November 19 would have been May 19, 1952, a ballpark guess for a potential baby’s birthday. Nine months before that date—roughly the time when the alleged baby would have been conceived—is August 1951, when Ron was fresh out of high school. Considering how rarely he dated back then, I’m sure Ron would have been free and clear of any worry that he’d fathered a child. The second possibility is that he wanted to donate blood. In 1952, the American Red Cross was fairly new to its blood program. 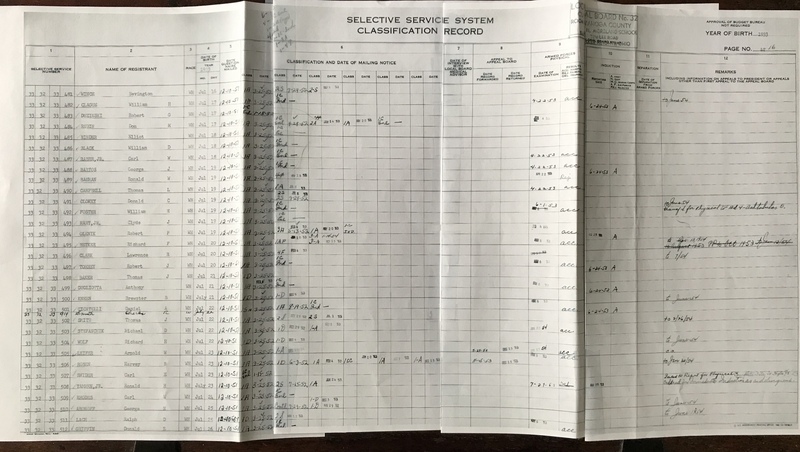 According to the organization’s timeline, its first national blood collection program began for the military during WWII and the first collection center for civilians was established in 1948 in Rochester, N.Y. The number of collection centers mushroomed to nearly 1600 the following year. But who would make a special trip—on a Wednesday—to a doctor 14 miles away to have his blood typed for the purpose of giving blood on a future date? Normally, if a person had blood donation on his mind, he’d walk into the collection center, they’d conduct a blood type test for him, free-of-charge, and he’d donate the blood then and there. Why visit a doctor in another town who was unknown to him and who certainly charged a fee? Or, as an alternative, why not get his blood typed at the student health center on campus, again likely for free? According to the 1973 Hamilton Journal-News article, when Doc Boone asked Ron point-blank why he needed to have his blood typed, Ron responded, “I might have to give some blood one of these days,” which always sounded made up to me. If he really meant to give blood, there wouldn’t have been a “might” or “one of these days”—he would have said, “I want to donate blood.” (Granted, we’re working with a quote that was provided 20 years later from memory, so we can’t be sure of its accuracy, but Doc Boone obviously wasn’t very sold on Ron’s excuse either.) To me, that quote sounded way too secretive. Ron was up to something, I decided, and it had nothing to do with blood donation. And then, last week, I talked to one of Ron’s fellow residents of Fisher Hall. As I was asking my source, let’s call him Joe, about a possible woman from Hamilton, he said he hadn’t heard any rumor about her nor could he recall ever seeing Ron with a woman. But then he described one memory that did stand out: He remembered Ron asking him one day if he would accompany him to Dayton to a facility where people were paid to donate blood. (Although we can’t know with 100 percent certainty that the facility was operated by the Red Cross, it’s true that the organization sometimes paid donors during this time period.) Joe remembers being apprehensive about it, but Ron pretty much insisted that he join him. Joe needed the money for a pending night out with a girl, so he agreed to go along. He hitchhiked with Ron to Dayton—in the snow—and remembers quite clearly thinking, “This is crazy. This is nuts.” But he looked over at Ron, and Ron seemed fine with it. Joe said it was probably December when they made their trip, which would have been a month or so after Ron’s blood type test, though it could have been a little later. I asked Joe if he needed to make a special trip to a doctor to have his blood typed beforehand, and he said, no, they probably took care of that at the collection center—either that, or he was already aware of his blood type. Joe was O positive, just like Ron. Ron and Joe received $25 apiece for the pint of blood they’d each donated, and then they hitchhiked back to Oxford. It was the only time Joe had joined Ron for such an excursion. Other than their trip to Dayton, they had very little contact. “He went his way and I went my way,” Joe said. It’s important to understand how substantial $25 was back then. Twenty-five dollars in December 1952 was roughly the equivalent of $230 today, which isn’t chicken feed. In an old Honeymooners episode that first aired in the spring of 1956, Ralph Kramden considered putting his bus driver job in jeopardy and becoming a steam iron salesman for a prospective $40 a day. “Imagine that—$40 a day!” he said to Alice. Twenty-five dollars in one afternoon probably seemed just as huge to Ron Tammen. And compared to the amount Ron earned as a Campus Owl, which was also pretty good money, $25 was a tidy sum that only required that he lie down for a short while. When Ron first heard of this amazing moneymaking opportunity, he might have felt the need to have his ducks in a row before setting off for Dayton. It would be frustrating to show up at a blood bank more than 40 miles away only to be turned back because he didn’t know his blood type. Or, maybe the collection center only paid for a certain blood type, so he’d need to know if he was eligible before he made the trip. That still doesn’t explain why he chose to visit Doc Boone’s office, but not everything going on in a 19-year-old guy’s head back then is going to make perfect sense today. Who knows—maybe he happened to be in the neighborhood. Furthermore, maybe he chose to hitchhike with Joe to Dayton—in the snow, no less—as opposed to driving his own car so that none of his earnings would be wasted on gas. By the early 1970s, the practice of paying blood donors became controversial as the opportunity to make good money in a physically undemanding way often drew people who were down on their luck and who were at high risk for diseases such as hepatitis. It was at this time that the American Red Cross switched over to a volunteer-only system. Could it be that, in the end, Ron Tammen had told Doc Boone the truth—that he “might have to give some blood one of these days”? The solution to this part of the Ronald Tammen puzzle may end up being just that obvious and that irrelevant to Tammen’s disappearance…and, in the words of Joe, also a little crazy and nuts. Have you considered that his parents/siblings do not share his blood type? Maybe he thought that he was adopted, and left to find his biological family. Or just thought he was adopted and left on a mission to find them, and ended up beginning a life as someone else; right or wrong. Interesting question. At one time, I wondered about adoption as well, but I’ve since ruled it out. First, the similarities between Ron and his living siblings are incredibly strong. 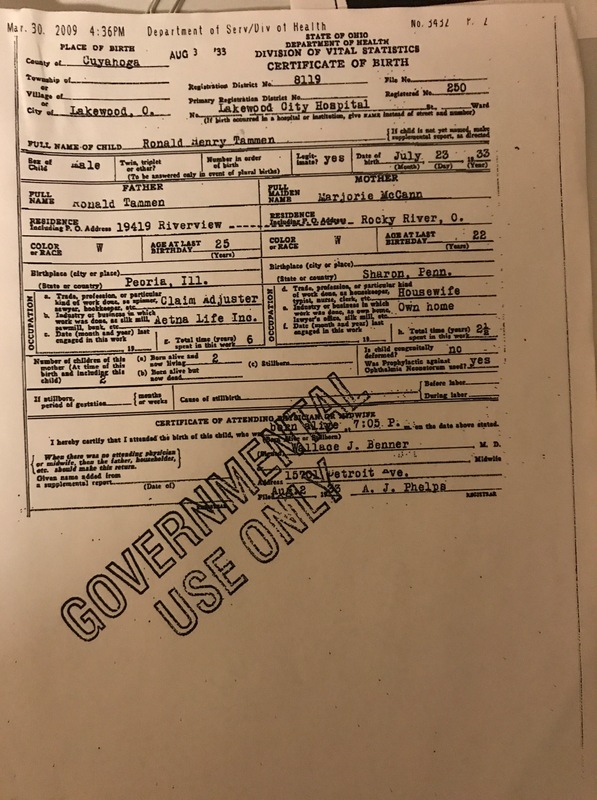 But most significantly, I have his birth certificate, which states that he was born to Ronald and Marjorie Tammen in Lakewood City Hospital on July 23, 1933. I don’t think I can attach his birth certificate to this response, so I’ll try posting it on the home page at the bottom, near the FOIA documents. Thanks for the question! Birth certificate is now posted. Have you nailed down what year the hitchhiking excursion to Dayton took place? That would be quite an adventure if he did it while he had his car on campus. On a related note, do you know if he had a car on campus is freshman year? Yes, it was during Ron’s sophomore year when he and “Joe” hitchhiked to Dayton. Also, according to Ron’s sister, Ron did not have a car on campus during his freshman year.